Part 1: Lessons For Texas Democrats In Alabama’s Big Victory? In a week filled with fast-moving political news, the Alabama victory of Senator- Elect is still the most fascinating out there. In his stunning defeat of Republican Roy Moore, Doug Jones became the First Democrat to win a United States Senate election in 25 years. In an off- off year election, this particular race has dominated the national media, in part because of Roy Moore’s many, many flaws as a candidate, not the least of which is his past filled with allegations of sexual harassment. But even with that history factored in, the election of Democrat Jones in a state that Donald Trump won by a whopping 28 points just a year earlier indicates that the pendulum may be swinging in the Democrats’ favor for 2018. RICHMOND, Va. — The American suburbs appear to be in revolt against President Trump after a muscular coalition of college-educated voters and racial and ethnic minorities dealt the Republican Party a thumping rejection on Tuesday and propelled a diverse class of Democrats into office. From the tax-obsessed suburbs of New York City to high-tech neighborhoods outside Seattle to the sprawling, polyglot developments of Fairfax and Prince William County, Va., voters shunned Republicans up and down the ballot in off-year elections. Leaders in both parties said the elections were an unmistakable alarm bell for Republicans ahead of the 2018 campaign, when the party’s grip on the House of Representatives may hinge on the socially moderate, multiethnic communities near major cities. And just one month later in Alabama, similar trends seemed to bare out. A diverse coalition of suburban voters in Alabama’s 5 largest counties put Roy Moore over the top, and completely erased Trump’s massive margin of victory from 2016. Interestingly enough, Texas voters have already shown movement in this direction. 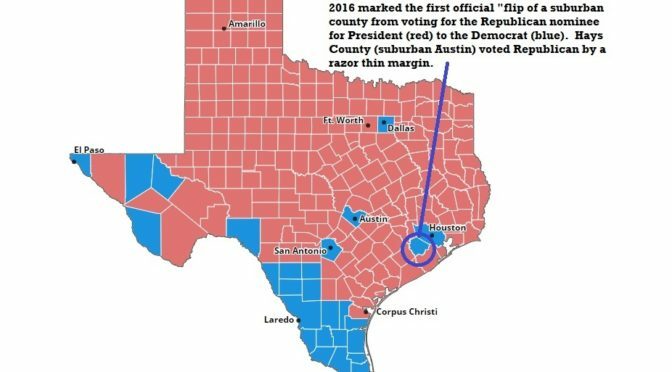 As I’ve written in the past, a big sign post for Texas to ever be considered a Swing State is not only Democrats winning in urban counties, but when they also become competitive in the suburbs. After years of reliable Republican wins in suburban counties, that streak finally ended in 2016. 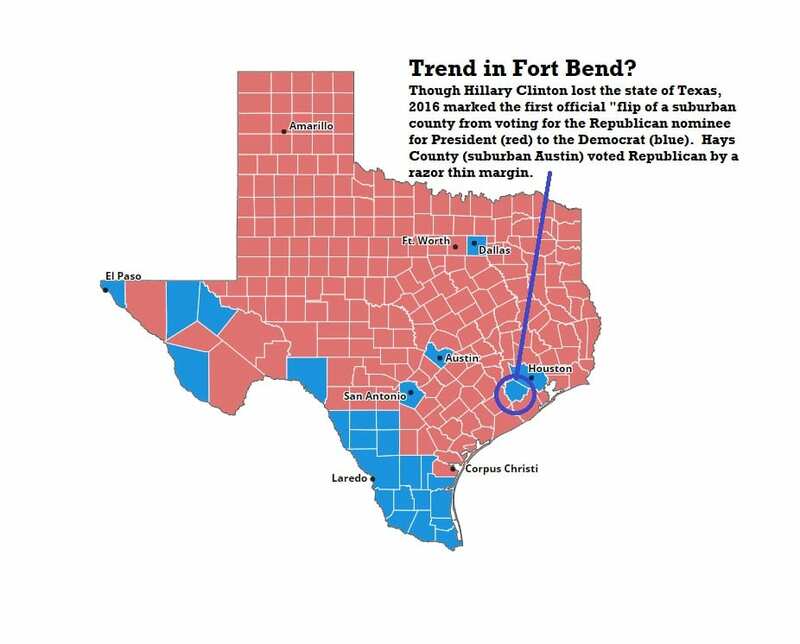 Not only was Donald Trump beaten in urban counties like Harris (Houston), Dallas and El Paso, but the suburban county of Fort Bend also went for Hillary Clinton. Donald Trump won the state of Texas by 9 percentage points, the smallest margin of victory for a Republican presidential candidate since the Bill Clinton era, and nearly 6 percentage points below Mitt Romney’s 2012 Texas victory over Barack Obama. So the lesson here? As with the rest of the country, 2018 is the year for Texas Democrats to get back into the suburbs, win or lose. While urban centers are still hugely important, Democrats cannot afford to leave our suburban friends out of the political conversation. What else was interesting from the Alabama contest?